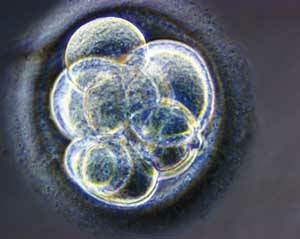 Britain's Brave New World: A new hybrid embryo bill ignores ethical concerns. The British Parliament’s decision on May 19 to allow laboratories in Britain to create a new kind of embryo, part human and part animal, was hailed as a victory for science over religious (and specifically Catholic) doctrine. In reality, it was the victory of a newly fashionable secularist dogma—the notion that scientific inquiry should be unconstrained—over the far more reasonable idea that tampering with human life for medical purposes requires a compelling ethical justification. The Parliament, in other words, has declared science in Britain to be an ethics-free zone. This was made clear during a panel discussion held on the eve of the vote on the Human Fertilization and Embryology Bill. The case in favor was put by a professor of genetics at Newcastle University, John Burn, a pioneer of stem cell research in the same institute that in the mid-1990s brought Dolly, the cloned sheep, into the world. Instead of a passionate defense of how vital embryonic stem cells are to future cures of Parkinson’s and Alzheimer’s disease, Professor Burn candidly admitted that most of the funding and resourcing at his Center for Life went into ethically incontrovertible adult stem cells, where all the therapeutic advances have so far been made. Embryonic research, he said, was a small sideline, involving just 5 percent of its research grants and only two scientists. But he believed that embryonic stem cell research (legal in Britain since the original H.F.E. Act of 1990) should continue, because it could yet yield results; and because there was a shortage of human eggs available for cloning, he wanted to be able to take a cow’s egg and fuse it with human cells. The future of embryonic research, in other words, requires hybrids (half-animal, half-human) as well as cybrids (99 percent human, 1 percent animal). Embryonic research was justified because it gave scientists more information about the behavior of early stem cell development, not because it was expected to lead to cures. Professor Burn had no ethical problem with embryonic research and did not see why the Catholic Church—which, he claimed, had bizarre theories about 14-day-old embryos having souls—should be allowed to stop him. Unlike the British prime minister, Gordon Brown, who has adopted the hype of the medical research lobby that embryo experiments are vital to achieving “breakthroughs” using stem cell research, Professor Burn stuck to facts. But what was missing from his justification was any moral calculation; there was no weighing up of the benefits of the ends against the ethical quandaries of the means. Having opened the door, he just wanted to open it farther, and he failed to see why anyone should block it with dogma. The church, in other words, was proposing a reasoned examination of the ethics weighed against the anticipated benefits—while the medical research lobby has been resorting to an entirely unreasonable claim to be free of any such examination. This is such a new area of biological science. Dealing with the "building blocks" of life! We shouldn't too quickly condemn what we barely understand. As far as I grasp this a copulation between two different species of mammals does simply not result in anything "alive". When between two closely related ones (donkey-horse) it is just possible, but does not create "progeny". A sperm cell is just a cell, and egg cell is just a cell. As far as I can see one can experiment with it to one's "science" heart content. Different when an embryo a beginning human life is at stake! Regarding "Britian's New World" by Austen Ivereigh (America 6/23-30/08) dealing with stem-cell research in England and Professor John Burn's input, who is a leading pioneer in stem-cell research, let me say this. The article goes far beyond being informative and stimullating reading- it is also more than frightening, it is actually absurd! Professor Burns sees nothing ethically, or morally wrong, in fusing human cells to cow eggs to produce what? In fictive, gentle lampoonery I ask, another St. Luke often depicted in ecclesial art as an Ox, or maybe an eagle like John, or a Lion like Mark? Matthew is in a different category depicted as part Angel! This tampering is called "hybrids" or "cybrids" the latter being 99% human, 1% animal! With Cardinal Keith O'Brien of Edinburg I'd call the whole mess "Frankensteinian" potentially resembling down the road in the finished products, the grotesque metaphoric images in Revelation! Who knows? Professor Burns calls "bizarre" Catholic theology that speaks of a 14 day-old embryo as having a soul. Is he also a theologian posessing competence to make theological up, or down, assertions? I don't think so! The Professor also says a 14 day-old embryo "looks like semolina." Did he ever stop to think how he looked 14 days prior to the embryotic stage, something that needs no description! What difference does all of this make anyhow? Everything! The greatest works of art begin with a single stroke, then 14, then much more until a magnificent work is peoduced, not to be tampered with out of respect for original artistic intent and purpose. Professor Burns and other stem-cell reserachers seem adverse to respecting the original intent and purpose of the Creator God. Concluding, however, let me say the emerging excellence of embryonic stem-cell research is an outstanding tribute of compliance to God's command to humanity to "subdue" the earth, that is, to righteously "control" it. God did not say to "redo" or "undo" the work of his hands! Apparently Professor Burns and other well-meaning (perhaps) but thelogically and ethically unenlightened scientists are trying to reinvent Divine intent. Their thinking is a tremendous threat to human integrity and should be universally ruled illegal. It is already ethically and morally unacceptable. This article also appeared in print, under the headline "Britain's Brave New World," in the June 23, 2008 issue. Austen Ivereigh, former adviser to Cardinal Cormac Murphy-O’Connor, is a writer and journalist based in London.